For the last eight months, the Cape Eleuthera Institute’s (CEI) flats ecology research team, in collaboration with Florida Atlantic University’s Harbor Branch Oceanographic Institute (FAU-HBOI), the Florida Institute of Technology (FIT) and the Bonefish & Tarpon Trust (BTT), has been investigating spawning mechanisms in bonefish as part of the Bonefish Restoration Research Project (BRRP). Work began just before the full-moon on the 31st of December 2017. 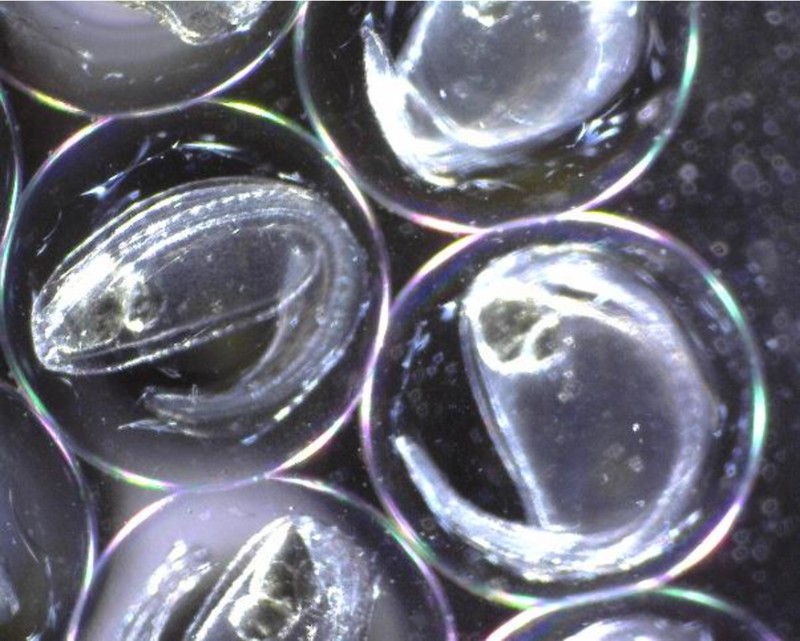 Using a series of reproductive hormone injections the team was able to successfully induce the final stages of egg maturity in a female bonefish that had been captured from a pre-spawning aggregation site and held in captivity. Days later the female was successfully strip spawned and fertilized with sperm collected from a mature male from the pre-spawning aggregation site. Just over 24 hours later this resulted in live bonefish larvae. 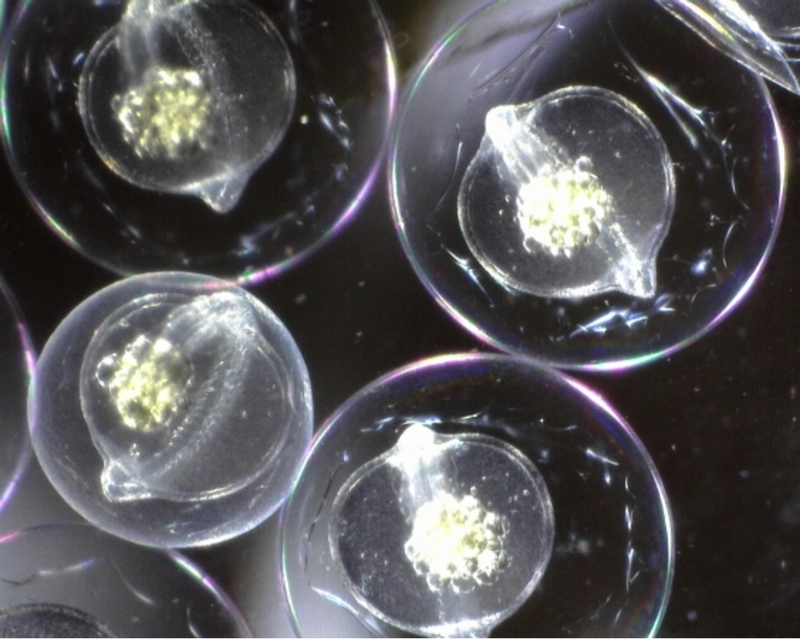 19 hours post-fertlization – the embryo is wrapped around a transparent yolk sac, with bubbles of oil on top of the embryo (oil for floatation and energy). 25 hours post fertilization – the embryo has developed to the point that the tail is now free from the tight circle where it was initially attached. 0 hours post-hatch (26 hours post fertilisation) the backbone and bands of muscle are evident along the body; the beginning of the eye is at the left. The oil droplets have coalesced into a single large droplet of oil by the belly of the larva. The transparent structure covering almost the entire bottom of the larva is filled with transparent yolk that will fuel growth until the larva develops its eyes, gut, mouth, etc. This is the first time ever that bonefish have been successfully strip spawned with viable fertilised eggs hatching into larvae. Very little is known about maturation, spawning and the early development of the leptocephalus, or “slender head” bonefish larvae. This successful spawn will provide essential information on future larval development, and the conditions required to successfully spawn and culture larvae in captivity. Work will continue over the upcoming full moons with the aim of continuing this success and gaining more knowledge to understand bonefish spawning and larval development.